One of the causes of pain that patients feel in their hands and feet is due to irritation of one or more of the nerve roots. The purpose of Nerve Root Block injections is to block one or more of the spinal nerves by injecting an anaesthetic and anti-inflammatory steroid into the space around the nerve. It is similar to an epidural steroid injection. 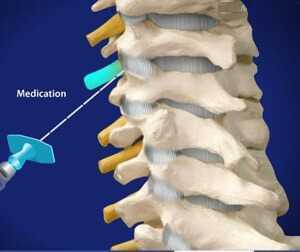 This procedure is also be used to evaluate patients with radicular pain, stenosis and other conditions that may result in nerve root compression. Do not eat anything 6 hours before your injection. Have water up to 2 hours before. You can take your regular heart and blood pressure medications on the morning of the injection with a sip of water. Diabetes medications should not be taken. If on blood thinners – contact your doctor or the person who prescribed the medication to get approval to stop taking them before the procedure. The skin in the are where the injection will be made will be cleaned and numbed. The anesthetic and steroid solution is injected. The injection procedure takes about 30 minutes. You will need to make a follow up appointment with your consultant to discuss your level of pain relief after the injection.